To other news and the fiery showdown on capitol hill. Matt Whitaker was gilled today about the Mueller investigation. He was asked did he talk to president trump and does he think it’s a witch hunt. Here’s ABC’s Pierre Thomas. Reporter: On capitol hill today, house Democrats tried to put the nation’s top law enforcement official on trial. We’re all trying to figure out who are you. Where did you come from? How the heck did you become the head of the department of justice? 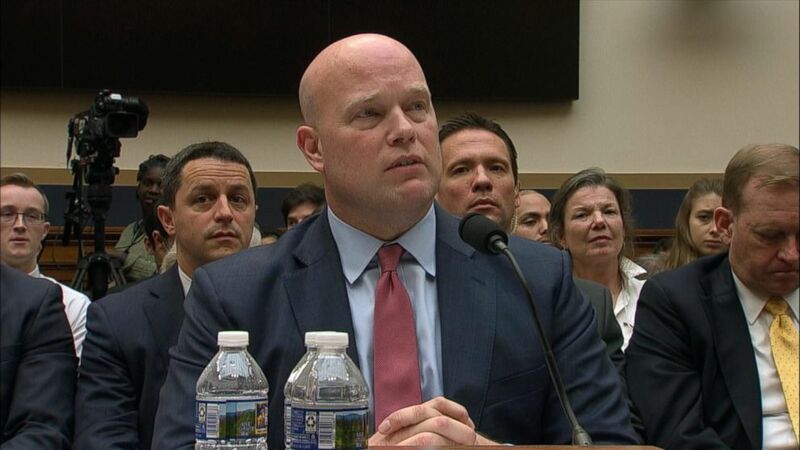 Well, I mean, congressman — Mr. Whitaker, that was a statement, not a question. Reporter: Democrats grilling acting attorney general Matthew Whitaker on the Mueller investigation. Whitaker pushing back. In your capacity as acting attorney general, have you ever been asked to approve any request or action to be taken by the special counsel? Mr. Chairman, I see that your five minutes is up, so — we — I am here voluntary. We have agreed to five-minute rounds. Reporter: Before president trump picked him for the job, Whitaker publicly questioned the Mueller investigation. But today he offered these assurances. I have not interfered in any way with the special counsel’s investigation. I have not talked to the president of TD states about the special counsel’s investigation. Reporter: But Whitaker refusing to answer whether the investigation, which he himself supervises, is a witch hunt, as president trump has said. Are you overseeing the witch hunt? Congressman, as I’ve mentioned previously, the special counsel’s investigation is an ongoing investigation, and so I think it would be inappropriate for me to — But you wouldn’t oversee a witch hunt, would you? You would stop a witch hunt, wouldn’t you? Congressman, it would be inappropriate for me to talk about an Ong investigation. Reporter: Republicans on the house judiciary committee blasting the hearing as a pointless chacter assassination. Bring your popcorn. I’m thinking maybe we just set up a popcorn machine in the back, because that’s what this is becoming. It’s becoming a show. Reporter: Baltimore police Pierre Thomas with us tonight. They’re also pressing the acting attorney general on his vent statement that the Mueller investigation was close to being completed. Did he learn that himself? They did press him. He refused to offer anymore details. He said Bob Mueller will finish when he wants to finish. Pierre, thank you. Next to the school shooting at the high school in Baltimore tonight.